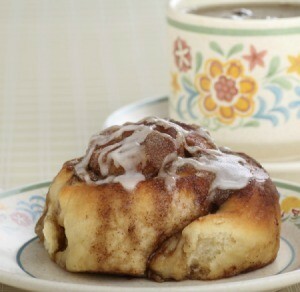 Who can resist the delicious smell of freshly baked sweet rolls for breakfast or any time? This page contains sweet roll recipes. Soften yeast in lukewarm water; set aside. Add shortening, sugar and salt to scalded milk; cook to lukewarm. Add enough flour to make a thick batter. Add yeast and eggs and beat well. Add enough more flour to make a soft dough. Turn out on floured area and knead. Place in greased bowl; cover and let rise until double. Punch down and shape into dinner rolls or cinnamon rolls. Let rise until at least double in size. Bake at 350 degrees F until golden brown, about 20-25 minutes. Mix together all roll ingredients, except sugar and cinnamon. Let rise 20-30 minutes. Punch down and roll out dough. Sprinkle with sugar and cinnamon. Roll up, cut on-inch thick, place cut side down on pan. Let rise a second time. Bake at 350 degrees F until brown. Should yield two jellyroll pans. For the topping, mix the margarine and the brown sugar and boil for 1 minute. Add milk and boil again. Add powdered sugar and beat until mixed. Put on topping while warm. Mix all ingredients together. Keep dough in refrigerator overnight. Then roll out and spread with butter, brown sugar and cinnamon. Let rise until double, then bake at 375 degrees F for 15-20 minutes. A quick and easy roll for brunch. Glaze, if desired.